Improved health is just one of the health benefits of the city of Carrollton, Georgia's bicycle-pedestrian GreenBelt trail. Equipping community members, organizations and local governments with the skills and tools to transform neighborhood parks and green spaces into dynamic community assets. The authors fulfilled their promise to their son, Leo, who died before the trio could embark on a planned trip to visit national parks in California and Utah. Edward Krafcik, Director of Strategic Partnerships and Business Development at Soofa. Over the course of her 37 year career, Mary Scheurer increased Portland's park and recreation facilities threefold and created the 8-mile Riverwalk trail that encircles the city. Part two of Parks & Recreation's conversation with Urban Ecologist, Marielle Anzelone about her plans to install a PopUP Forest in New York City's Times Square. An artistic rendering of the temporary PopUP Forest installation Urban Ecologist Marielle Anzelone is planning for Times Square in 2017. Staff members of the Lawrence, Kansas, Parks and Recreation Department were surprised and excited to have Jim O’Heir, who played Jerry Gergich on the television show “Parks and Recreation,” stop by to present the agency's 2015 Gold Medal Award nomination plaque. Small-sided soccer, a fast growing sport in the United Kingdom, offers an ideal setting in which to teach children the basic skills of the sport. Is the Pope for Parks? He’s informal, witty and personable, but does Pope Francis really like parks? From her home base deep in the heart of Texas, former NRPA Board Chair Lois Finkelman has established herself as a lifetime friend of parks and recreation. Greece, New York, Supervisor Bill Reilich’s efforts to revamp his town’s parks and recreation department is paying major dividends. Dr. Lillian Rivera views parks as yet another tool for health in her medical bag. Teresa Baker has made a mission of expanding diversity in national parks and beyond. Tom Nardone and the Detroit Mower Gang volunteer their time and effort to maintain the financially troubled city's overgrown parks and playgrounds. Revitalization efforts at a small Texas park inspired a local businessman to spearhead programming designed to build stronger community ties. Jill Erickson has made conservation her life’s mission, and with the Heartland Conservation Alliance, she’s well-prepared to tackle one of the country’s largest urban watersheds. Tom Norquist, senior vice president of product development and design at PlayCore’s GameTime, has made a career out of his love for play. Buffalo Mayor Byron talks about the state of parks and recreation in his town and why a robust park system is so important to his constituency. Hialeah, Florida, Mayor Carlos Hernandez discusses the importance of parks and recreation in his adopted home town. The mother of two young boys whose passion for outdoor activity garnered international attention talks about their family and their new all-access park. The president of the newly formed National Dog Park Association shares her motivations and plans for uniting canines and parks. Knoxville, Tennessee’s Mayor Madeline Rogero is a dedicated supporter of her city’s parks and works with a variety of partners to ensure that Knoxvillians have access to the many natural resources the city provides. Tribute to Karla Henderson, Ph.D. The field of parks and recreation honors the career of contributions that Karla Henderson, Ph.D., has given the field. She will retire after 35 years as a park and recreation researcher and faculty member at the end of the spring 2014 semester. Jennifer French’s ongoing journey from tragedy to mobility benefits from an adaptive outdoor gym. 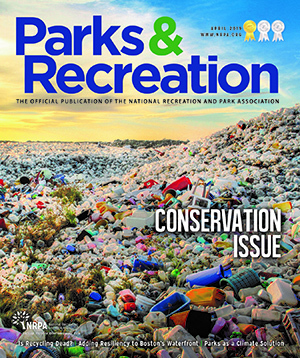 Parks & Recreation Magazine catches up with Jacksonville, Florida, Mayor Alvin Brown, who highlights kayaking and other forms of outdoor recreation as significant priorities for his administration. A Boise, Idaho, businessman donates an 18-hole championship golf course to his hometown. Parks & Recreation Magazine catches up with Des Moines Mayor Frank Cownie to talk about his passion for recreation as well as his environmental stewardship plans for his city. An Idaho high school student uses laser technology to remove graffiti from city parkland. Volunteer bike librarians support reading for everyone. A Florida police chief uses parks and recreation programs to help at-risk youth. San Francisco's leader has a passion for innovation and investment in parks.